Polaris Industries is recalling the RANGER 4x4 utility vehicle. The lower steering shaft assembly may have a missing or misplaced weld that connects the steering wheel to the steering gear box assembly. If a weld is missing or misplaced, the lower steering shaft assembly could fail, causing the operator to lose control of the vehicle. There have been 2 reports of the lower steering shaft assembly failing. No injuries have been reported. All model year 2005 RANGER 4x4 Utility Vehicles with model number R05RD50AA are part of this recall. The model number is located on the upper right frame tube directly under the right side of the seat. 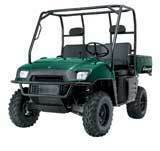 The RANGER 4x4 Utility Vehicles have black seats with a green chassis. RANGER 4x4 is prominently displayed on the right and left side of the rear cargo box. Polaris dealers sold these Utility Vehicles nationwide from June 2004 to September 2004 for about $8,899. Free repair is offered. Contact your Polaris dealer to schedule an appointment to replace the steering shaft assembly. Polaris has notified consumers directly about this recall. Robertshaw Controls Company is recalling about 425,000 Robertshaw 7000 Series Gas Control Valves because they present a fire hazard. If the pilot light goes out, the gas valve could stick in an open position, permitting gas to continue to flow. This can result in a gas explosion and fire, which could result in severe personal injury or property damage. The firm has received three reports of flash fires, involving three reports of injuries. The injuries involved first and second degree burns. The 7000 Series Gas Valves that are being recalled are installed in gas appliances including residential space heaters, wall heaters, boilers, fireplaces, pool heaters, infrared heaters and furnaces, and commercial heating applications such as commercial cooking appliances, fryers, commercial water heaters, and poultry brooders. The recalled valves were manufactured between February 2003 and September 2004 and have production dates beginning with code 0306 and ending with 0436. However, not all 7000 Series valves manufactured during the indicated timeframe are being recalled. Of particular note are model numbers containing the letters MV. Recalled gas valves include MV models that also include the letters LP and model numbers 7000AMV; 7000BMV; 7000BMV-S7CL; 7000MVLC; and 7000MVRCLC. All MV valves with the indicated date codes that have been converted to Liquid Propane (LP) gas use are also included in the recall. NOT included in the recall are model numbers 7010 and above; model numbers containing the letters D or BV; and model numbers containing the letters MV except for the ones listed above. A full list of recalled model numbers is available at www.robertshaw.com or can be obtained by calling (800) 232-9389. The units were sold through gas appliance retailers and distributors; food service equipment manufacturers and dealers; specialty retailers, such as fireplace, pool and spa dealers; and poultry equipment manufacturers. The gas control valves and components were also sold separately through gas appliance service providers. Consumer Contact: Call Robertshaw toll-free at (800) 232-9389 from 7 a.m. to 7 p.m. CT, Monday through Friday, or visit www.robertshaw.com to review a list of affected appliances and register for the recall. Zippo is recalling more than 100,000 multi-purpose utility lighters. The lighters may spill fuel from the nozzle when first used, causing a potential fire hazard through a secondary source of ignition. There have been 27 reports that the butane fuel spills out of the nozzle when first used. There have been no reports that the product ignited or caused any injury. Description: The Zippo MPL (Multi-Purpose Lighter) uses refillable butane fuel, is child resistant, and measures 8 inches long and 1 inch wide. The utility lighter is finished in black metal or silver metal with a chrome nozzle. The black unit is packaged in a blister pack with black and red graphics and the silver unit is in a silver gift box. Only utility lighters with these date codes are recalled: G03, H03, I03, ZH03. The date code is on the black adjuster knob on the bottom of the lighter. The Zippo Multi-Purpose Lighters were sold at Lowes, Bed Bath & Beyond, select Yankee Candle stores, Barbeque Galore, Harrington and Hammacher Schlemmer Catalog, select Wal-Mart stores and other convenience, hardware and home, hearth and patio stores from October 2003 to September 1, 2004. Remedy: Free replacement multi-purpose lighter when consumer sends to the company the black adjuster knob from the bottom of the lighter. Consumer Contact: Consumers should visit www.zippomplrecall.com or call Zippo toll-free at (888) 670-2940 between 9 a.m. and 9 p.m. ET Monday through Friday to get the address to which the black adjuster knob must be sent. Return Procedures: Consumers who own the Zippo MPL (Multi-Purpose Lighter) with date codes G03, H03, I03, ZH03 should immediately stop using this product and remove the black adjuster knob with the date code. Pull the knob straight downward with your fingers or use pliers to remove the knob. Keep the knob to be returned to Zippo Manufacturing Company. Consumers should dispose of the lighter in a manner that is in compliance with state or local requirements. Do not incinerate or puncture the lighter. Do not return this lighter to the store where purchased or to Zippo. Teng Fei Trading Inc. is recalling about 81,000 energy-saving light bulbs. The base of the bulb is not flame-retardant, as required in the voluntary standard for this type of bulb. Electrical components in the bulb can overheat, posing a fire hazard. These Teng Fei Energy Saving light bulbs are white, compact fluorescent bulbs. The recall includes model numbers T6112, T6113, T6114, and T6115. The model number is written on the packaging only. Teng Fei 110-127V 50/60Hz is written on the bulb. 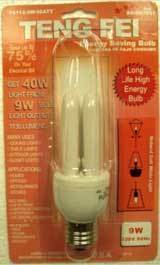 The bulbs were sold at various 99 stores in the state of New York from November 2003 to March 2004 for about $0.99. Consumers should immediately stop using these light bulbs and return them to the store where purchased for a refund. Consumer Contact: Consumers should call Teng Fei Trading Inc. collect at (718) 888-7000 between 9 a.m. to 5 p.m. ET Monday through Friday. 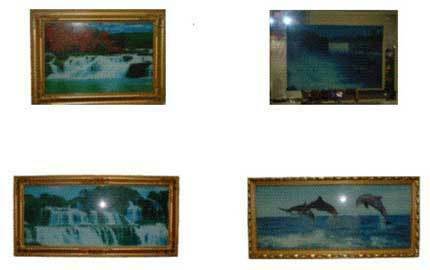 Chicago Wholesale & Imports is recalling about 3,500 moveable waterfall pictures. The electric pictures have inadequate construction, incorrect wiring, and use flammable materials, all of which pose fire and electric shock hazards to consumers. The recalled electric pictures are framed artwork that utilizes electric lights and sound and feature moving background scenes, including waterfalls and beach scenes. The paintings come with wooden, glass mirror, or plastic frames. The pictures come in seven different sizes: 180cm x 112cm, 148cm x 98cm, 118cm x 74cm, 98cm x 48cm, 65cm x 45cm, 26cm x 20cm, and 25cm x 25cm. Flea markets and dollar stores in the Midwest, primarily in the Chicago area, sold the pictures from April 2003 through April 2004 for between $20 and $150 (depending on the size). Consumers should stop using the electrical components to the pictures immediately and return them to Chicago Wholesale & Imports for a refund. Consumer Contact: For information on returning the picture, consumers should call Chicago Wholesale & Imports toll-free at (866) 885-1986 between 9 a.m. and 4:30 p.m. CT Monday through Friday or log on to the companys Web site at www.getyourscooter.com. Chrysler is recalling 1.2 million minivans because of an electrical problem that could cause the driver's side air bag to fail. About 955,000 of the recalled vehicles are in the United States. The vehicles affected are the Dodge Caravan and Grand Caravan, Plymouth Voyager and Grand Voyager and Chrysler Town and Country from the 1998-2000 model years. The same problem prompted a recall of 1996-1998 minivansin 2002. The National Highway Traffic Safety Administration (NHTSA) said its records show that four people have been injured in crashes because of the defect and there have been 782 complaints about the problem. The defect involves a clock spring that supplies current to the driver's side air bag, the horn and the cruise control, the company said. If the clock spring is working properly, the air bag warning light will illuminate for a few seconds when the vehicle is started and then go out. If the air bag warning light isn't working properly, the clock spring may have failed. Dealers will replace the clock spring for free on vehicles with less than 70,000 miles. The company will extend the warranty on the clock spring for vehicles with more than 70,000 miles. The company said it will start notifying customers about the recall this week. About 875,000 package terminal air conditioners/heat pumps are being recalled because of a fire hazard. The commercial-grade units carry the Amana, Trane and American Standard brands. The chain of events that potentially leads to a fire is: filter becomes clogged due to lack of maintenance, severely restricting airflow and resulting in elevated internal temperature; this may cause two safety switches to stop working during the products expected life; if the blower wheel then stops when the product is operated in the heating mode, a fire hazard can develop. Goodman Company, the manufacturer, received 29 confirmed reports of units overheating, including eight instances where the PTAC ignited and, in some cases, caused minor property damage. No injuries have been reported. These PTACs are owned mainly by commercial and institutional organizations and are used in the lodging industry, apartments, hospitals, nursing homes and assisted living facilities, schools, and government buildings. A small number of the recalled units are owned by individual homeowners. The PTACs are beige in color and are intended for through-the-wall installation. Goodman manufactured all of the recalled units, which were sold under the Amana, Trane, and American Standard brand names. Goodman and Trane/American Standard are separate, unrelated entities. The recalled PTACs consist of Amana brand units manufactured from January 1996 through March 2003, and Trane and American Standard brand units manufactured from January 1996 through August 2002, that use electric heaters rated at 3.5 kilowatts (kW) or greater. The serial and model numbers are below the operating controls under the front cover assembly. To check the serial and model numbers, remove the front cover by pulling it from the bottom straight out until the clips release, then lifting it up. For some units, it is first necessary to remove two screws (in the filter compartment) that secure the front cover. Amana, Trane, and American Standard representatives sold the PTACs to hotels/motels, hospitals, assisted living facilities, schools, and apartment complexes. Heating, ventilation and air conditioning distributors and resellers sold the units to commercial customers and, in some cases, homeowners. The recalled units were sold throughout the U.S. and parts of Canada between January 1996 and March 2003. Remedy: Free thermal safety limit switch. Commercial and institutional owners will install the replacement switch themselves. Individual homeowners can get a free repair. Contact the Goodman Hotline to receive the free replacement thermal safety switch. Inspect and clean the air conditioner/heat pump filters immediately to remove any imminent hazard. Continue to clean these filters every 30 days in accordance with manufacturers recommendations which can be found at www.regcen.com/PTAC. Owner Contact: Call the Goodman Hotline at (800) 729-6122 between 7 a.m. and 6 p.m. CT Monday through Friday. Owners can submit a PTAC Recall Information Form at Goodmans Web site www.regcen.com/PTAC. Bombardier is recalling several of its snowmobiles because the throttle lever can become stuck leading to loss of speed control and possible collision. BRP has received two reports alleging stuck throttles. No injuries have been reported. The units were sold at Ski-Doo dealers nationwide between December 2002 and August 2004 for about $7,000 to $9,900. Owners of affected units will be notified directly. Consumers should contact an authorized Ski-Doo dealer to schedule an appointment for repair, free of charge. Consumer Contact: Contact Bombardier Recreational Products Inc. at (888) 864-2002 between 8:00 a.m. and 6:00 p.m. ET. The recall is being conducted in cooperation with the U.S. Consumer Product Safety Commission ( CPSC).